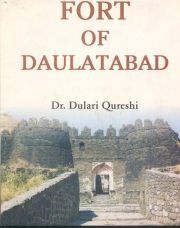 About the Book;The present book,"Daulatabad Fort", Throws light on all the architectural creations in and around Daulatabad Fort.The book has also throws light on the water system of the period. Besides the architectural remains, the book has taken special pains to assess and evaluate the present condition of all these remains. The book has further attempted to identify all major problem areas and offered useful suggessions for a planned development and expertise to create a more satisfectory experience for the tourists. About the Author;Dr Dulari Qureshi, who hails from Aurangabad, is a highly learned and articulate academician, has smade a distionguished mark in the intellectual circles. She holds a Doctorate in Art History;the topic of her thesis being,`Art and Vision of Aurangabad Caves` She also armed with a degree in Journalism and a post graduate diploma in tourism. She has written 270 articles on art, culture and tourism development and its impects on monumentsShe is presently teaching in the Department of Tourism Administration, Dr.Babasaheb Ambedkar Marathwada University, Aurangabad. Bibliographic Information: xvi,114P.+64Col.Plates, Figs.Biblio Index,Ref.